Hopefully this won't shock you, but there are many Easter treats and goodies that don't belong in your baby's Easter basket. For example, Easter eggs. The USDA Food and Nutrition Service notes that you should wait to introduce egg whites or whole eggs until your baby is older than one-year, because introducing eggs too early may cause food allergies. Plastic, easy to break toys and many small and/or chewy candies also pose a choking risk for babies, so avoid those too. And please, no matter your child's age skip live Easter animals! 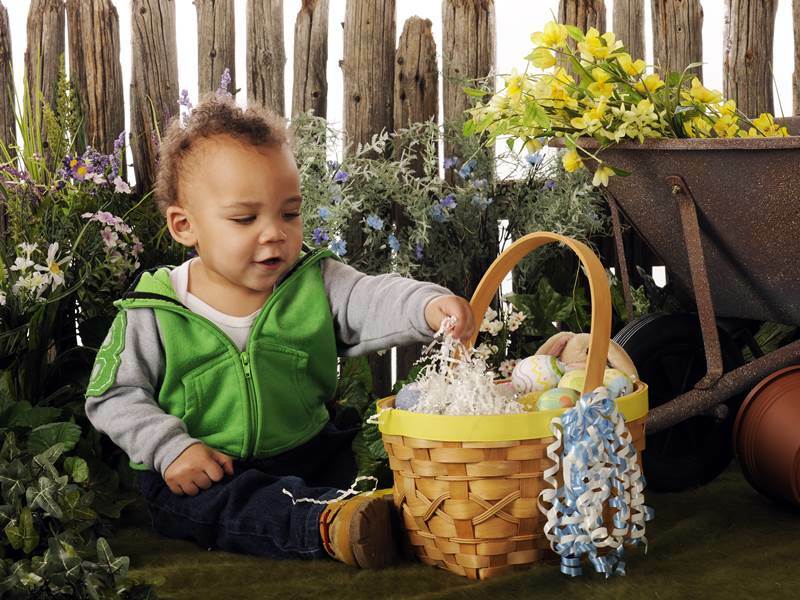 The above said, if your baby is under one year-old, you can still create a fabulous Easter basket. 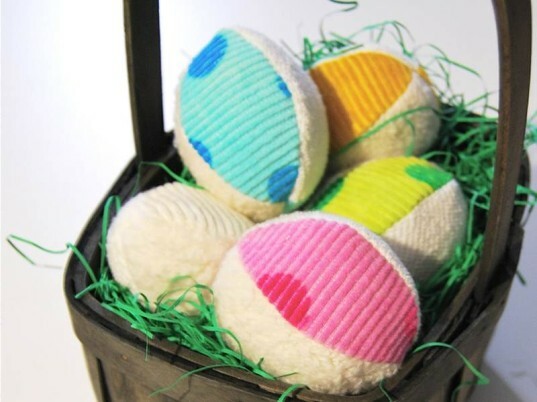 Check out our favorite, handmade, safe and sweet Easter gifts for babies below. This teething toy is made of natural, unfinished wooden beads, 2 wooden rings and a cute rabbit’s head in your choice of color, made of 100% cotton crochet. This teether is way more than a simple teether. It also holds your baby’s attention and helps her develop her grip and fine motor skills. All parts are very safe for baby, fixed to each other, so no worries about choking. This super sweet wooden baby rattle is great for little hands and makes a soft, soothing sound when shaken. The surfaces are all sanded to a satin smooth and finished with homemade, organic jojoba oil/beeswax polish. This rattle comes beautifully packaged in a muslin bag and can be personalized if you’d like. This too cute pair includes a mama (or papa) and little baby Waldorf bunny. Each soft, cuddly and safe bunny is hand-knit with natural fibers and stuffed with eco-friendly poly/bamboo fiber or cleaned and carded locally-sourced wool. Bunnies can be custom made in any fiber or color combination. 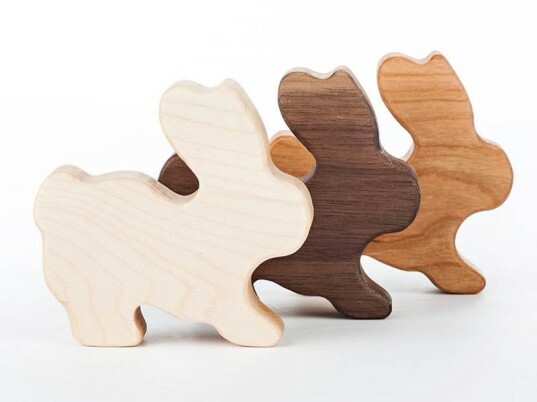 These clever teethers are perfect for Easter. 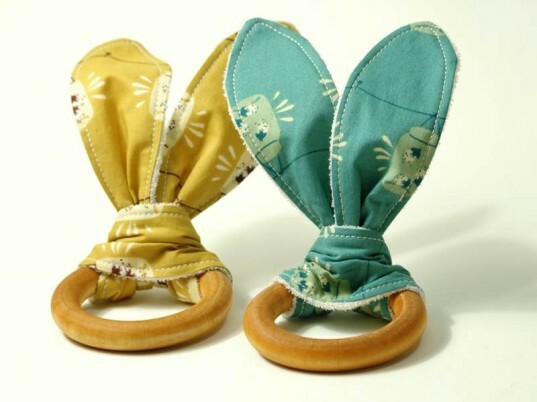 Made with a natural hardwood teething ring plus organic terry cloth bunny-looking ears, each teether is eco-friendly and safe. Many colors and fabric designs to choose from too. These colorful Easter eggs won’t cause any allergies, but they will offer plenty of fun. Each egg can be used as a rattle, tossing ball, play food and more! Made of natural eco-friendly organic cotton blends and bamboo fabric and filled with all natural kapok fiber and a tiny jingle bell for some sensory appeal. 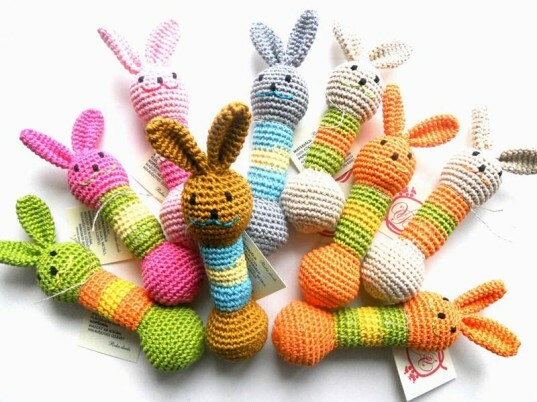 With a unique shape and clear bunny appeal, this Amigurumi Rabbit Rattle looks great in a baby’s Easter basket. This rattle is hand-crocheted from 100% cotton. There is a big bell in one end of it with a soft sound, and it’s filled with 100% natural sheep’s wool. The rabbit’s face is hand embroidered for safety. Helps to develop baby’s touch, hearing and fine motor skills and older kids can use this as a musical instrument. Suitable for babies from 3 months and up. 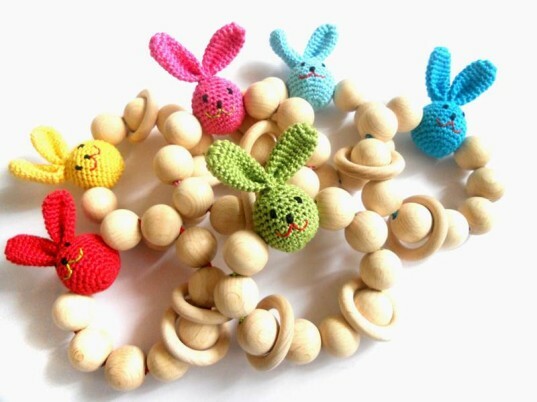 This teething toy is made of natural, unfinished wooden beads, 2 wooden rings and a cute rabbit's head in your choice of color, made of 100% cotton crochet. This teether is way more than a simple teether. It also holds your baby’s attention and helps her develop her grip and fine motor skills. All parts are very safe for baby, fixed to each other, so no worries about choking. This super sweet wooden baby rattle is great for little hands and it makes a soft, soothing sound when shaken. The surfaces are all sanded to a satin smooth and finished with homemade, organic jojoba oil/beeswax polish. This rattle comes beautifully packaged in a muslin bag and can be personalized if you like. These colorful Easter eggs won't cause any allergies, but will offer plenty of fun. Each egg can be used as a rattle, tossing ball, play food and more! Made of natural eco-friendly organic cotton blends and bamboo fabric and filled with all natural kapok fiber and a tiny jingle bell for some sensory appeal. 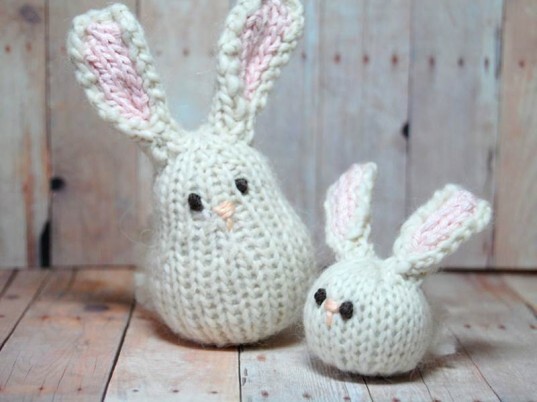 With a unique shape and clear bunny appeal, this Amigurumi Rabbit Rattle looks great in a baby's Easter basket. This rattle is hand-crocheted from 100% cotton. There is a big bell in one end of it with a soft sound, and it's filled with 100% natural sheep's wool. The rabbit's face is hand embroidered for safety. Helps to develops baby's touch, hearing and fine motor skills and older kids can use this as a musical instrument. Suitable for babies from 3 months and up.